Oprah Winfrey really does do Transcendental Meditation. Oprah’s organization OWN (Oprah Winfrey Network) has just published an article about her visit to Fairfield last month. This link is to a press announcement about the premiere of her new TV series Oprah’s Next Chapter (starts in January), and includes a brief mention that Oprah also travelled to a small town in Iowa devoted to the practice of Transcendental Meditation, and that this would be covered during the series. 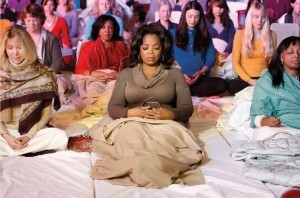 OWN also posted on Facebook this picture of Oprah meditating in the Golden Dome reproduced here, with thanks. So what does it mean when the most influential woman in the world turns to a technique like Transcendental Meditation? For one thing, it confirms the impression she has always given me of being seriously interested in self-improvement, in upliftment and leadership. We met her at her leadership school near its launch. At that time she had the whole school instructed in TM. We went down to meet some of the new teachers and to make the initial arrangements. I think it was a Sunday afternoon, and she was sitting on low brick wall, flanked by her trusted hair and face helpers. She was friendly, personable and forthcoming. “You look just like Taddy” she said to me, referring to our great Taddy Blecher, who I think handled the request to get Transcendental Meditation into her school. (here he is on youtube giving a talk on how free education can free South Africa). Like most people who are larger than life, she is surprisingly slight when you meet her. Maharishi Mahesh Yogi was like this too. So huge in what he was, that when my fortunate eyes fell on the real person, it was a surprise to see he was so small. So we wish Oprah so much fulfillment, in her inner life as well as outer.